The booking will be charged the full amount of the first night non-refundable. If the cancellation is made two weeks ago, will be charged the full amount. If the group are minors ask their parents&#39; permission. Hostel Colours is a fun, friendly and modern hostel in Milan, offering excellent amenities and located in Via Desiderio 24 corner Via Pacini, just 150 meters from the subway green line M2 Lambrate FS Station which, conveniently connects, few stops, to the historical city centre of Milan and, only 4 stops, to the Milan Central Station. Comfortably to reach also the Milan Malpensa, the Milan Linate and the Orio al Serio airports by the 'shuttle bus' departing from and to the airports every 20-30 minutes from Milan Central Railway Station, Air Terminal. Clean and very close to Milano Lambrate railway station. Friendly people at the desk and 24h check-in (we arrived at 3 am, which was no problem at all). Great hostel, buffet rocks and very friendly staff. Only the wifi was slightly dodgy, but there are plenty of people to talk to when you can't use your phone. Definitely worth it! Easy to meet new people as a solo traveler because of the bar-lounge-kitchen-reception(24h) space where everyone hangs around. Staff are really helpful and friendly! Location is not in the center but anyways very good because you are near to a metro stop (just around the corner), a supermarket, bars, restaurants and a bank. Breakfast was included in the price but could be a little bit better, rooms are clean and had big lockers. Definitely will stay here again. Great place to stay. You feel at home at once! Hostel Colors was actually recommended by my roommate at another hostel, as I last minute decided to head out to Milan for a night. I am very satisfied with the hostel in general! The guy at the reception was very welcoming and made sure to explain and show everything. He even offered to carry my luggage up the stairs! The room was very tidy and the bathroom was clean! About a 3min walk to the metro station and 5min walk to the busstop with direct connection to the airports. - Worth every Euro! The space you got inbetween the beds is not that much. Include the price for the aircon in the price of the room!!! I suggested it already to a guy at your hostel. It's weird! Just adapt the price per night to the season, like almost every ho(s)tel does. The showers looked really dirty. I'm talking about the shower itself and the edges were black, which does not give you a very clean feeling after all. I would recommend this hostel, only if they change the things that I said. Cozy and crowded hostel when i was here. Very easy to meet other travelers. Rooms (mine was 12p) are a bit full i think, not much space left, on the other hand: 2 bathrooms, wich was perfect. Breakfast was below the expectations: dry bread or crackers, 'lemonade' and coffee out of an office-machine. Printing a document for train costs 0,50ct(?!) 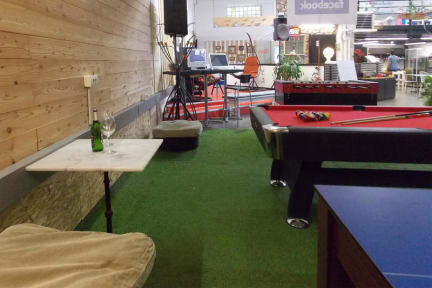 In the evening its a nice place for sofa hangers and playing billiards. I would definitely not stay here again. This hostel is dirty and worn out, staff is unprofessional (during my check-in she answered 3 private phone calls) and their prices are not what they seem: you have to pay a euro extra for MANDATORY air conditioning (just include it in the price, this is simply lying about the price in my opinion). The atmosphere in the hostel is non-existent. Pro's: location near the green metro line stop. Do yourself a favour and book an other hostel.